>Former Secretary of State Hillary Clinton is visiting SC on February 23-26, 2016. On February 23 she held a Breaking Down Barriers town hall with five mothers who lost their children to gun violence and police incidents, at Central Baptist Church in Columbia; and participated in a CNN town hall at University of South Carolina in Columbia. On the afternoon of February 24 she is to speak at the Alpha Kappa Alpha Sorority statewide luncheon at Brookland Baptist Conference Center in West Columbia; and hold a Breaking Down Barriers town hall at Garrick-Boykin Human Development Center at Morris College in Sumter. 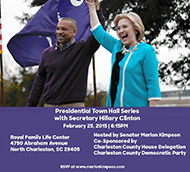 On February 25 she plans a Corridor of Opportunity town hall at Williamsburg County Recreation Center in Kingstree; a Dreaking Down Barriers town hall with Sen. Cory Booker at Cumberland United Methodist in Florence; a GOTV event in the ballroom at Sheraton Myrtle Beach Convention Center Hotel; and a presidential town hall at Royal Baptist Church Family Life Center in North Charleston. On February 26 she plans a GOTV HBCU rally in Dukes Gymnasium at South Carolina State University in Orangeburg. >Sen. 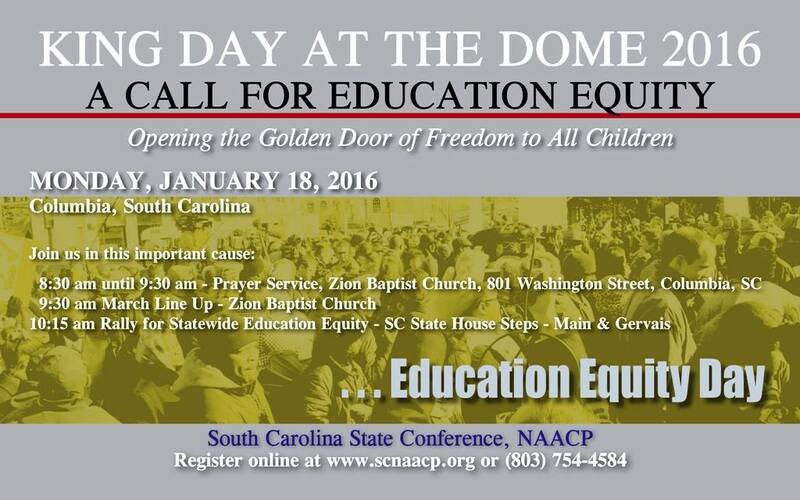 Bernie Sanders is visiting SC on February 23-24, 2016. On the evening of February 23 he participated in a CNN town hall at University of South Carolina in Columbia. On the morning of February 24 he is to hold a press conference on poverty in South Carolina at the DoubleTree in Columbia. includes Biden 5 visits, 5 days. >Sen. Bernie Sanders held a Future to Believe In rally at Bon Secourse Wellness Arena in Greenville, SC on February 21, 2016. >Sen. 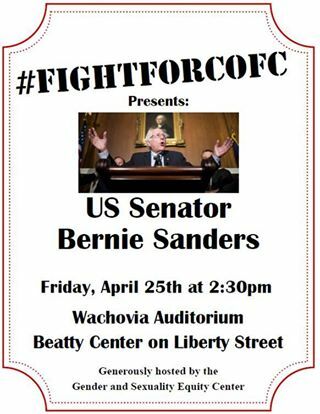 Bernie Sanders visited SC on February 16, 2016. He appeared at a faith leaders prayer breakfast with special guest Shirley Murdoch at Allen University in Columbia; held a town hall at Russell House Theater at the University of South Carolina in Columbia; and held a town hall at Memminger Auditorium in Charleston. >Former Gov. 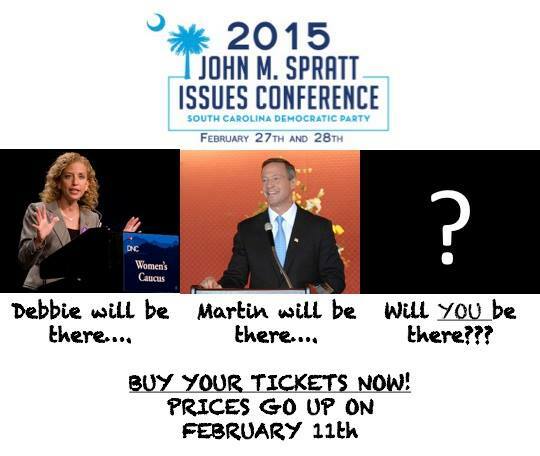 Martin O'Malley visited SC on January 16-18, 2016. On January 16 he held a town hall discussion moderated by Cynthia Hardy, host of OnPoint! at the Milton Kimpson Center for Graduate Studies and Continuing Education Building at Benedict College in Columbia; spoke at the SCDP's First in the South Dinner at the Charleston Marriott in Charleston; and spoke at Congressman Jim Clyburn's World Famous Fish Fry at Charleston Visitor Center bus shed in Charleston. On January 17 he participated in the NBC News and YouTube Debate at the Gaillard Center in Charleston. On January 18 he spoke at the NAACP Rally for Statewide Education Equity at the State House in Columbia; and spoke to the Columbia Rotary Club at Seawell's Restaurant in Columbia. >Sen. Bernie Sanders visited SC on January 16-18, 2016. 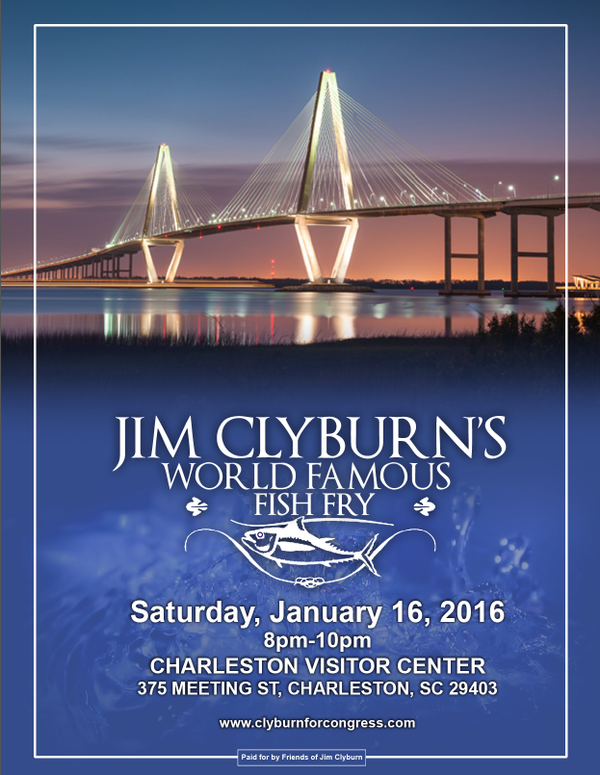 On January 16 he spoke at the SCDP's First in the South Dinner at the Charleston Marriott in Charleston; and spoke at Congressman Jim Clyburn's World Famous Fish Fry at Charleston Visitor Center bus shed in Charleston. On January 17 he did a "Legacy of Martin Luther King, Jr. National Live Stream Conversation" with Killer Mike, Dr. Cornel West and State Sen. Nina Turner; and participated in the NBC News and YouTube Debate at the Gaillard Center in Charleston. On January 18 he spoke at the Martin Luther King, Jr. Day Rally for Statewide Education Equity at the State House steps in Columbia. 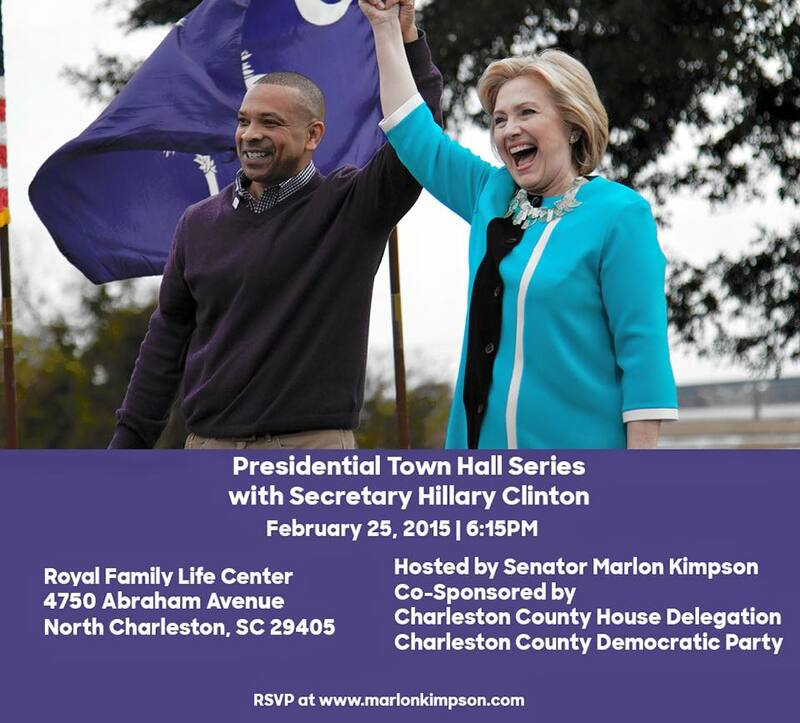 >Former Secretary of State Hillary Clinton visited SC on January 16-18, 2016. On January 16 she addressed the SCDP's First in the South Dinner at the Charleston Marriott in Charleston; and spoke at Congressman Jim Clyburn's World Famous Fish Fry at Charleston Visitor Center bus shed in Charleston. On January 17 she participated in the NBC News and YouTube Debate at the Gaillard Center in Charleston. 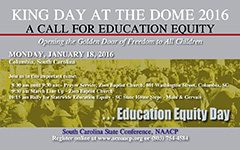 On January 18 she spoke at King Day at the Dome 2016 on the State House steps in Columbia. Multi - Former Sec. of State Hillary Clinton, former Gov. 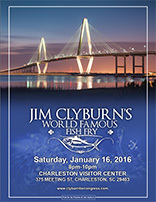 Martin O'Malley, and Sen. Bernie Sanders spoke at the SCDP's First in the South Dinner at the Charleston Marriott; and spoke at Congressman Jim Clyburn's World Famous Fish Fry at Charleston Visitor Center bus shed in Charleston, SC on the evening of January 16, 2016. >Former Gov. 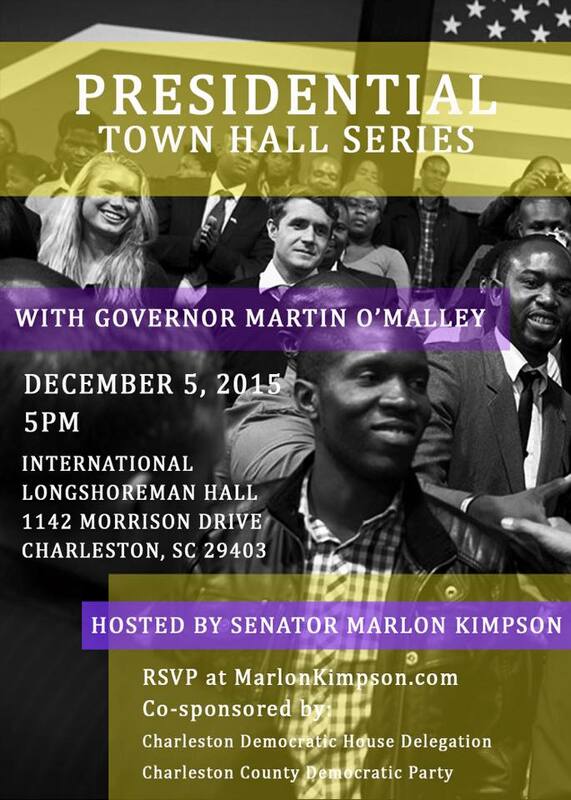 Martin O'Malley participated in a town hall with Sen. Marlon Kimpson, co-sponsored by the Charleston Democratic Party and the House Democratic Delegateion at ILA Local 1422 in Charleston, SC on December 5, 2015. >Sen. 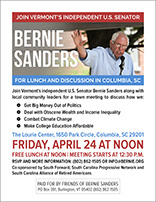 Bernie Sanders visited SC on November 20-22, 2015. 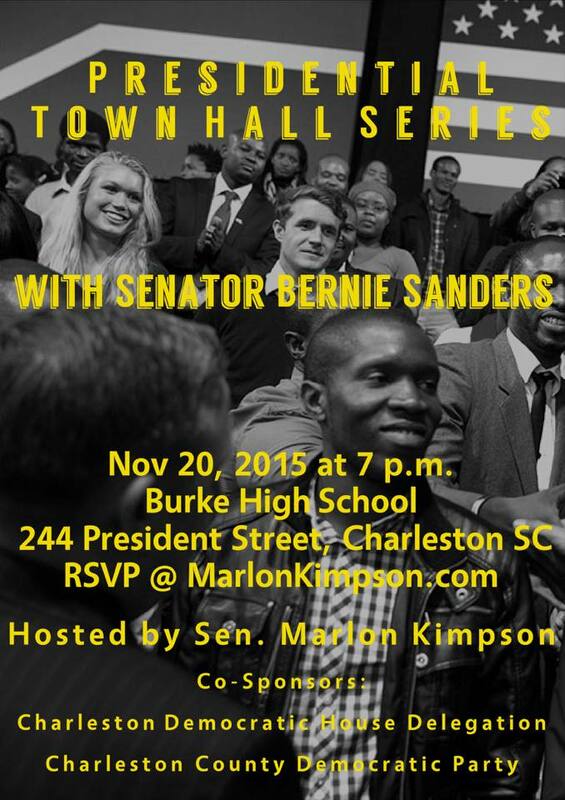 On the evening of November 20 he participated in a town hall hosted by state Sen. Marlon Kimpson at Burke High School in Charleston. 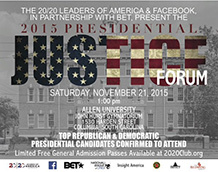 On November 21 he spoke at the Charleston County Democratic Party Blue Jamboree at Jenkins Institute for Children in North Charleston; participated in 20/20 Leaders of America's Presidential Justice Forum at Allen University in Columbia; filed for the primary and held a rally at SCDP headquarters in Columbia; and held a town hall at South Carolina State University in Orangeburg. On the afternoon of November 22 he held a town hall in Darrah Hall at Penn Center on St. Helena Island. Multi - Former Gov. 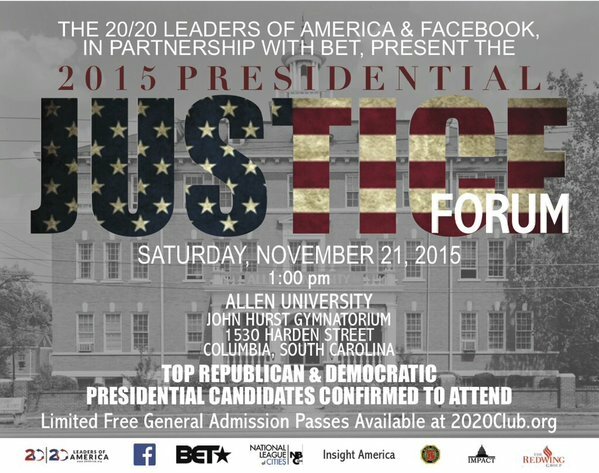 Martin O'Malley and Sen. Bernie Sanders (along with Dr. Ben Carson) are scheduled to participate in 20/20 Leaders of America's Presidential Justice Forum at Allen University in Columbia, SC on November 21, 2015 (+). Multi - Former Sec. of State Hillary Clinton, former Gov. 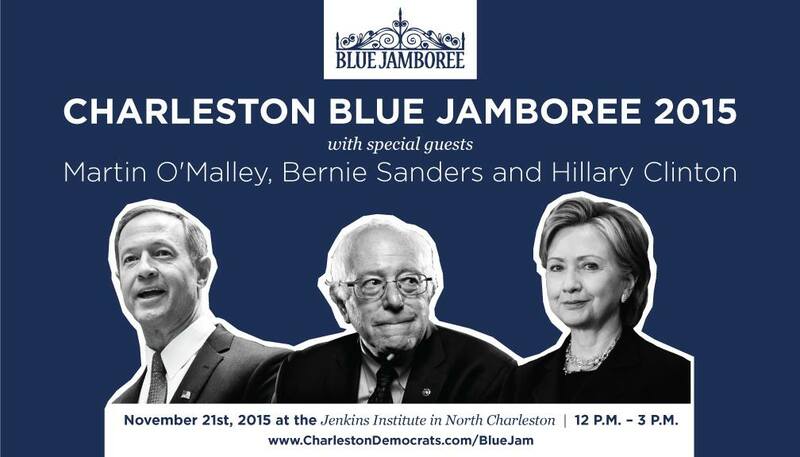 Martin O'Malley and Sen Bernie Sanders spoke at the Charleston County Democratic Party Blue Jamboree at Jenkins Institute for Children in North Charleston, SC on November 21, 2015. >Former Gov. Martin O'Malley visited SC on November 21, 2015. He spoke at the Charleston County Democratic Party Blue Jamboree at Jenkins Institute for Children in North Charleston; and participated in 20/20 Leaders of America's Presidential Justice Forum at Allen University in Columbia. >Former Secretary of State Hillary Clinton spoke at the Charleston County Democratic Party Blue Jamboree at Jenkins Institute for Children in North Charleston, SC on November 21, 2015. >Sen. Bernie Sanders visited SC on November 6-7, 2015. On the evening of November 6 he participated in The First in the South Candidates Forum at Winthrop University's Byrnes Auditorium in Rock Hill. On November 7 he is to delivered the keynote speech at the 2015 Southern Regional Meeting of the National Federation of Democratic Women at Whitton Auditorium, Vivian Moore Carroll Hall in Rock Hill; held a press conference at the Columbia Conference Center in Columbia; and held a town hall meeting at USC Aiken Convocation Center in Aiken. >Former Sec. 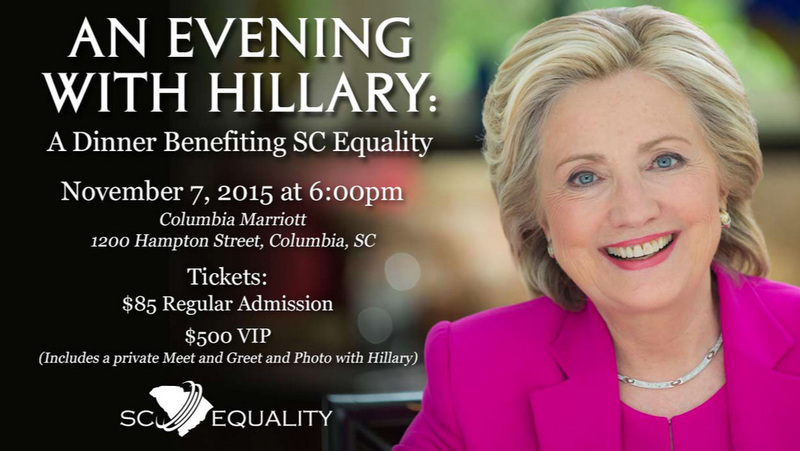 of State Hillary Clinton visited SC on November 6-7, 2015. On the evening of November 6 she participated in The First in the South Candidates Forum at Winthrop University's Byrnes Auditorium in Rock Hill. Early afternoon on November 7 she spoke at a town hall hosted by the South Carolina Legislative Black Caucus and moderated by News One Now’s Roland Martin at Claflin University, Ministers' Hall in Orangeburg; and in the evening she delivered the keynote address at a fundraising dinner for SC Equality at Columbia Marriott in Columbia. >Former Gov. 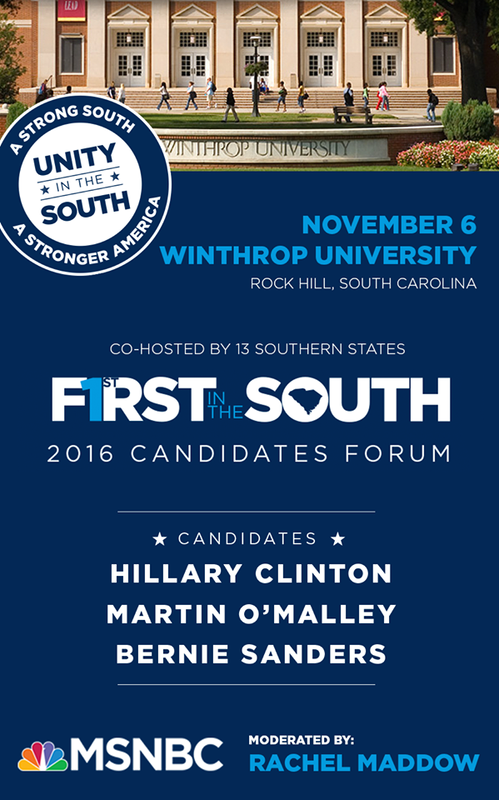 Martin O'Malley participated in The First in the South Candidates Forum at Winthrop University's Byrnes Auditorium in Rock Hill, SC on November 6, 2015. >Former Sec. of State Hillary Clinton visited SC on October 30-31, 2015. On the evening of October 30 she delivered the keynote address for the Charleston Branch NAACP’s 98th Annual Freedom Fund Banquet at the Charleston Area Convention Center in North Charleston. On the morning of October 31 she spoke at a grassroots organizing meeting at the International Longshoreman Hall in Charleston. >Sen. Bernie Sanders visited SC on September 12, 2015. He held a town hall meeting in the HRC Arena Benedict College gymnasium at Benedict College; held an OTR leadership meeting in Florence, did a town hall meeting at the Civic Center Arena in Florence; and rallied in The West Center at Byrnes Auditorium at Winthrop University in Rock Hill. >Former Gov. 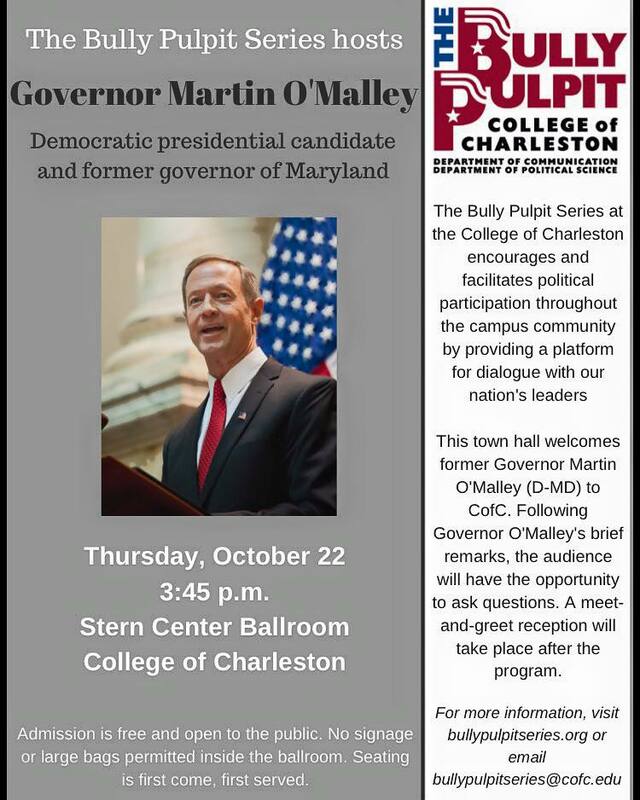 Martin O'Malley visited SC on October 22, 2015. He made a private visit to Emanuel AME Church in Charleston, site of the June 17 shootings; met with faith, community and political leaders on healing the community while addressing gun policy reform at the Family Life Center at Mt. Moriah Missionary Baptist Church in North Charleston; addressed the Bully Pulpit Series at the College of Charleston in Charleston; and attended a reception hosted by Mullins McLeod and Boyd Brown at the Victor Social Club in Charleston. >Sen. Bernie Sanders visited SC on August 21-22, 2015. On August 21 he rallied at TD Convention Center in Greenville; met privately with about 40 elected officials and ministers at Springfield Baptist Church in Greenville; met privately with about 50 pastors and community leaders at Macedonia Baptist Church in Spartanburg; and held a town hall meeting at the Medallion Center in Columbia. On August 22 he held a town hall meeting at the Sumter County Civic Center in Sumter; met privately with elected officials and community leaders at the Fairfield Inn in Orangeburg; and a rallied at the Charleston Convention Center in North Charleston (originally scheduled for Burke High School gymnasium, but venue changed to acommodate larger crowd). (Vice President and Dr. Jill Biden vacationed at Kiawah Island, SC from August 8-13, 2015). >Former Gov. Martin O'Malley visited Columbia, SC on August 4, 2015. He held a roundtable discussion with 20/20 Leaders of America at the Sheraton Columbia; and did a lunch roundtable discussion with members of HBCU leadership at an unannounced location. >Former Sec. of State Hillary Clinton visited SC on July 23, 2015. She held a discussion with South Carolina mayors and local officials at the Brookland Baptist Church Banquet and Conference Center in West Columbia; and held a forum "to discuss her economic vision to help South Carolinians get ahead and stay ahead" in Heritage Hall at Greenville Technical College Northwest Campus in Greenville. [Vice President Biden and Dr. Jill Biden were at Kiawah Island overnight on June 26 and on June 27-28, 2015. On June 28 he made a surprise appearance at Emanuel AME Church in Charleston, where he attended services]. [Former Secretary of State Hillary Clinton attended the funeral services of Rev. Clementa Pinckney at College of Charleston TD Arena in Charleston, SC on June 26, 2015]. [President Barack Obama, First Lady Michelle Obama, Vice President Joe Biden and Dr. Jill Biden attended the funeral services of Rev. Clementa Pinckney at College of Charleston TD Arena in Charleston, SC on June 26, 2015]. [Former Gov. Martin O'Malley visited SC on June 24, 2015 to pay his respects to the late state Sen. Clementa Pinckney at the Capitol in Columbia, SC]. >After her launch event on June 13 and stops in IA and NH, former Sec. 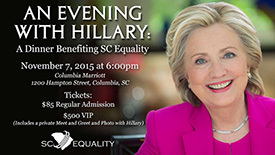 of State Hillary Clinton visited SC on June 17, 2015. She met with community leaders to discuss rural issues iat the Santee Conference Center in Santee; and held a forum to discuss job training and apprenticeships at Trident Technical College in North Charleston. >Former Sec. of State Hillary Clinton visited Columbia, SC on May 27, 2015. She met with minority women small business owners at Kiki's Chciken and Waffels in Columbia; and delivered the keynote address to the South Carolina House Democratic Women’s Caucus and the South Carolina Democratic Women’s Council at their Third Annual Day in Blue at the Columbia Marriott. >Former Sen. Jim Webb spoke at Gallabrae, the Greenville Scottish Games, at Furman University in Greenville, SC on May 23, 2015. Multi - Former Gov. Lincoln Chafee, former Gov. Martin O'Malley and Sen. Bernie Sanders along with representatives of former Sen. Jim Webb (David "Mudcat" Sanders) and former Sec. of State Hillary Clinton (Gov. Terry McAuliffe) spoke at the South Carolina Democratic Convention in Columbia, SC on April 25, 2015. (Sen. Mark Warner delivered the keynote at the Jefferson Jackson Dinner on April 24). >Gov. Martin O'Malley visited Columbia, SC on April 25, 2015. He addressed the South Carolina Democratic Convention at the Metropolitan Convention Center. >Former Gov. Lincoln Chafee visited Columbia, SC on April 24-25, 2015. On April 24 he attended the Jefferson-Jackson Dinner at the Metropolitan Convention Center; and attended Rep. James Clyburn's World Famous Fish Fry at the Cannon Parking Garage. On April 25 at the Metropolitan Convention Center he attended breakfasts, and addressed the South Carolina Democratic Convention. >Sen. 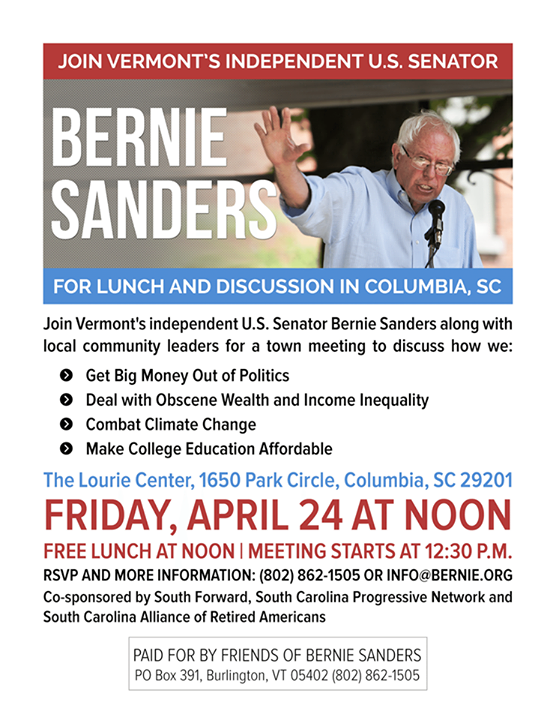 Bernie Sanders visited Columbia, SC on April 24-25, 2015. On April 24 he held a free lunch and town meeting at the Lourie Center; attended the Jefferson-Jackson Dinner at the Metropolitan Convention Center; and attended Rep. James Clyburn's World Famous Fish Fry at the Cannon Parking Garage. On April 25 at the Metropolitan Convention Center he attended the South Carolina Democratic Mayors breakfast; the Democratic Women's Council breakfast, and addressed the South Carolina Democratic Convention. (President Obama held a town hall at Benedict College in Columbia, SC on March 6, 2015). >Former Gov. 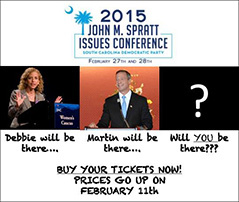 Martin O'Malley addressed the SCDP's 2015 Spratt Issues Conference at the Sheraton Myrtle Beach in Myrtle Beach, SC on the afternoon of February 28, 2015. >Vice President Joe Biden visited SC with Transportation Secretary Anthony Foxx on February 18, 2015 as part of the Department of Transportation's GROW AMERICA tour to highlight the importance of investing in America's infrastructure. In the morning they spoke at Wando Welch Terminal at the Port of Charleston; and in the afternoon they spoke at Owen Steel in Columbia. Biden then made an unannounced stop at Kiki's Chicken and Waffles where, per the pool reported he greeted employees and patrons and ordered red velvet waffles. (On February 19 Biden and Foxx made the third of three stops at Extravaganza Depot in Charlotte, NC). No visits between Election Day Nov. 4 and the end of the year. Subtotal for the Pre-Campaign Period: From Nov. 7, 2012 through Election Day, Nov. 4, 2014, three potential candidates made 11 visits totaling 12 days. >Gov. Martin O'Malley visited SC on November 1, 2014 to campaign with gubernatorial nominee Vincent Sheheen. He joined Sheheen at a meet and greet at the SC Democratic Party field office in Moncks Corner; at a get-out-the-vote rally hosted by state Sen. Marlon Kimpson at Trident Technical College main campus in North Charleston; and dropped in to thank volunteers working to get out the vote at the SC Democratic Party field office in North Charleston. 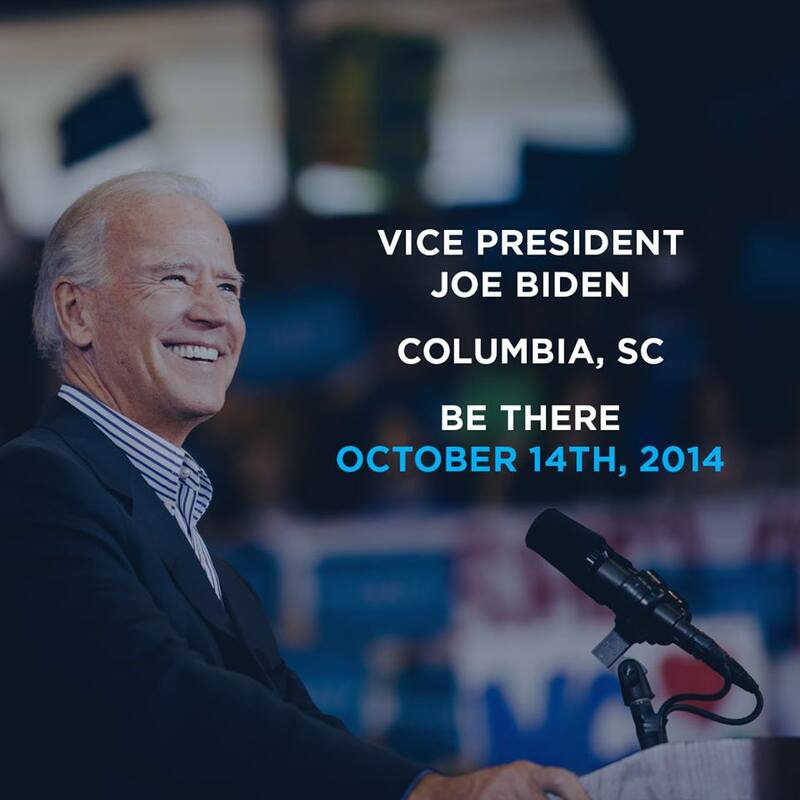 >Vice President Joe Biden, joined by his wife Jill Biden, visited Columbia, SC on October 14, 2014. He attended a meeting with African-American clergy at Allen University; headlined a "Commit to Vote" event at the Allen University gymnasium; and attended an event for the South Carolina Democratic Party at a private residence. >Gov. 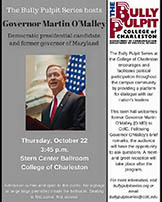 Martin O'Malley visited SC on September 20, 2014. As reported by the Washington Post's John Wagner, he campaigned with gubernatorial candidate Vincent Sheheen at the Clarendon County Breakfast at Trinity AME Church in Manning; appeared at a rally with Sheheen and lieutenant gubernatorial candidate Bakari Sellers at Hopkins Park in Hopkins; and he "appeared at the South Carolina Pride festival in Columbia for about a half hour at the request of Sheheen." >Sen. 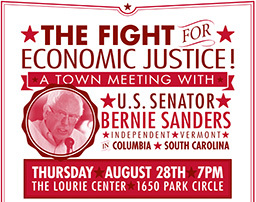 Bernie Sanders held a town hall meeting at The Lourie Center in Columbia, SC on the evening of August 28, 2014. The independent Ready for Hillary super PAC's Hillary bus visited SC colleges and universities on August 19-21, 2014: Clemson University, South Carolina State University (HBCU), Claflin University (HBCU); (Aug. 21) the University of South Carolina, and The College of Charleston. Out of state note: Politico's Maggie Haberman reported on June 12 that Gov. Martin O'Malley was a special guest and Vice President Joe Biden stopped by a fundraiser for gubernatorial candidate Vincent Sheheen at a private home in Washington, DC on the evening of June 11, 2014. (Vice President Joe Biden and Dr. Jill Biden vacationed at Kiawah Island, SC from May 31-June 3, 2014). >Gov. Martin O'Malley spoke at a fundraiser for gubernatorial candidate Vincent Sheheen at The Alley in Charleston on late afternoon on May 9, 2014. He and wife Katie attended the graduation of his daughter Tara from the College of Charleston on May 10. >Vice President Joe Biden visited Columbia, SC on May 9, 2014. He spoke at a fundraising lunch for the South Carolina Democratic Party at the Capital City Club; and delivered the commencement address in the Colonial Life Arena at the University of South Carolina. The independent Ready for Hillary super PAC held a roundtable with South Carolina grassroots leaders and RfH's Hans Goff at the Clarion Hotel in Columbia, SC late on the afternoon of May 1, 2014. Additionally on the morning of May 3, 2014 Sen. Tim Kaine (VA), speaking at the South Carolina Women’s Democratic Council breakfast in Columbia, SC, announced he was joining the Ready for Hillary effort. >Sen. Bernie Sanders visited Charleston, SC on April 25, 2014. He spoke at the College of Charleston's Wachovia Auditorium hosted by the Gender and Sexuality Equity Center and6 #FightForCofC; and campaigned for 7th CD congressional candidate Gloria Bromell Tinubu at a rally at the meeting hall of International Longshoremen's Association Local 1422; and at a fundraising reception at the home of chef and author Nathalie Dupree. 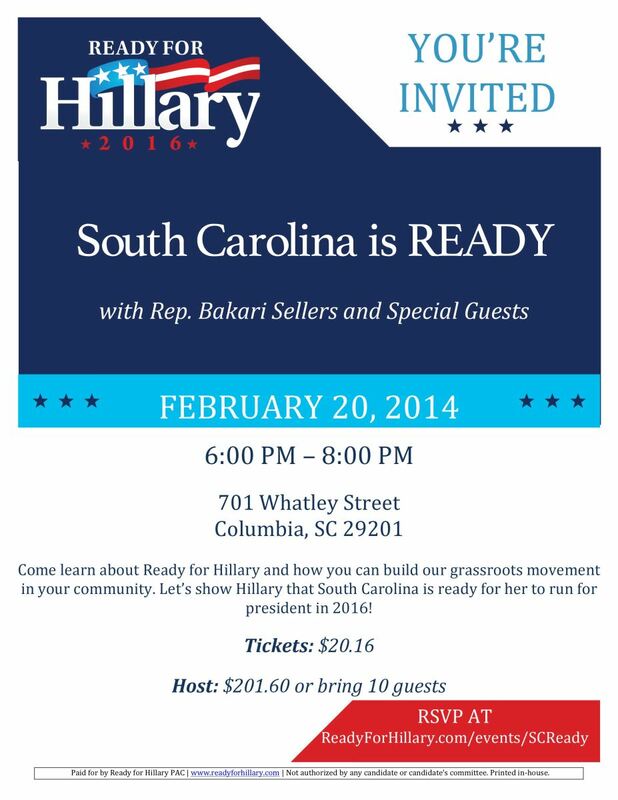 The independent Ready for Hillary super PAC held its first SC fundraiser at 701 Whatley St. in Columbia, SC on the evening of February 20, 2014. >Sen. Bernie Sanders visited SC on October 18-19, 2013. On the evening of October 18 he spoke at a "Fight for Economic Justice" town hall meeting sponsored by South Forward at the Eau Claire Print Building in Columbia. On October 19 he spoke at the S.C. Progressive Network fall retreat at Penn Center on St. Helena Island. >Vice President Joe Biden made an official visit to the Port of Charleston in Charleston, SC on September 16, 2013; he spoke about "the importance of infrastructure investment to exports, economic competitiveness, and job creation." >Vice President Joe Biden delivered the keynote address at the South Carolina Democratic Party’s Jefferson-Jackson Dinner at the Metropolitan Convention Center and dropped by Rep. Jim Clyburn’s annual Fish Fry at the Carolina Field House in Columbia, SC on the evening of May 3, 2013. (Vice President Joe Biden and Dr. Jill Biden vacationed at Kiawah Island, SC from March 29-April 2, 2013). >Gov. Martin O'Malley addressed the South Carolina Democratic Party's 2nd Annual Issues Conference at West Ashley High School in Charleston on March 23, 2013.